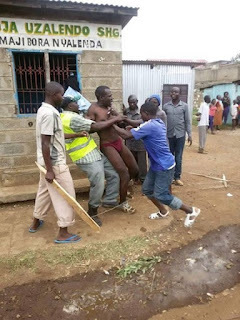 A s3xually starved Kisumu man was recently roughed up residents after he was caught by the owner of the house while having lungula with the wife in Nyalenda, Kisumu. The lady's husband is said to have set a trap for his wife after realizing that she was dishing out her flesh to other men. He organized some goons who str!pp3d the guy clandestine lover uchi and taught him a lesson he will never forget after catching them in the act.